Mohu curve 50 brings a fresh look to indoor antennas, while delivering the same great top performance as Our famous Leaf antenna. We believe there's no reason why an antenna in your living room shouldn't be both highly functional and beautiful. Designed to be easy to plug in and set up, the curve 50 allows you to quickly enjoy free access to available over-the-air TV broadcast channels in crisp, clear pictures in full 1080p HDTV. The curve 50 can find all over-the-air broadcast TV channels within a 50-mile radius of your home. 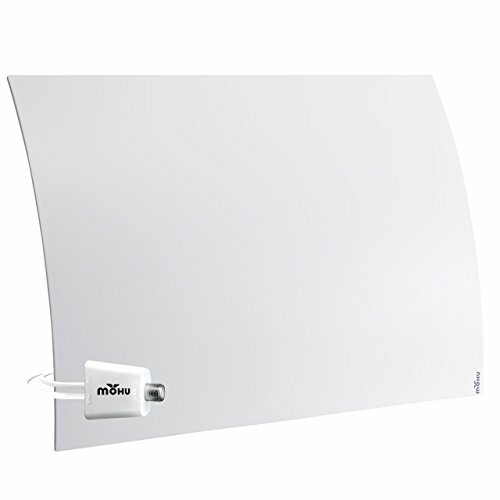 This multi-directional antenna comes with a 16 ft. Cable and an included antenna amplifier with clean peak filtering technology. With clean peak, the amplifier filters out cellular and FM signals, letting you pull in a clearer picture, receive more channels, reduce dropouts and increase your overall viewing experience. Depending on what's broadcast in your area, you'll soon be able to watch popular National TV networks and local TV shows at no cost. With the Mohu curve 50 you no longer have to pay high monthly cable or satellite bills to enjoy your favorite shows. The curve 50 can pull in your favorite local and National news, weather, sitcoms, kids' shows, TV Series and sports programming with no monthly contract or bills. Free TV for life: Now tested to reach over-the-air TV channels up to 60 miles away without a cable or satellite subscription including ABC CBS NBC PBS Fox Univision and more. Multi-directional HDTV antenna: receive crystal-clear picture in up to full 1080 HD (4K ready) in any direction no pointing" needed." Easy installation: lay your Curve 50 flat or stand upright on any flat surface - comes with included stand and 10 foot high performance coaxial cable. Enables access to free channels: does not enable access to paid channels such as ESPN/Fox News. Before you buy visit Mohu website to see the channels available in your area. Curve 50 comes with a 1-year warranty. Contact Mohu for setup help. Before you buy, visit gomohu.com/amazon to see what channels are available in your area.